REPEAT/Team Hot Wheels™ Lands Guinness World Records® Title as Drivers Race Through Six-Story-Tall Double Loop at X Games Los Angeles 2012 | Mattel Inc.
EL SEGUNDO, Calif.--(BUSINESS WIRE)-- Two drivers for Team Hot Wheels™ set a Guinness World Records® title Saturday June 30 for successfully racing through a 60-foot-tall double vertical loop at X Games Los Angeles 2012. The Team Hot Wheels™ Double Loop Dare, a life-sized version of a Hot Wheels® orange track set, defied gravity with a first-of-its-kind two-driver challenge. Green Driver Greg Tracy, one of Hollywood's top stuntmen, took first place victory as he edged three-time X Games gold medalist and Hot Wheels® Yellow Team Driver Tanner Foust as the two simultaneously raced through the giant up-side-down loop. View the record-breaking stunt at Hot Wheels YouTube page. 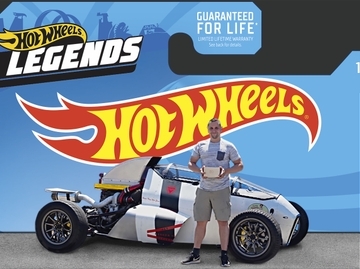 "Boys of all ages around the world imagine playing with Hot Wheels on a life-size scale — and our vision with Team Hot Wheels was to transform this fantasy into reality," said Simon Waldron, vice president marketing, wheels, Mattel. "The Double Loop Dare was truly a can't-miss spectacle that altered the Los Angeles skyline. Anyone downtown couldn't miss this massive six-story-tall bright orange structure — it was unmistakably Hot Wheels." The Team Hot Wheels™ Double Loop Dare was modeled after the new Team Hot Wheels™ Double Dare Snare™ track set — available globally at retail — which lets boys race their 1:64 scale Hot Wheels® cars side-by-side in a vertical loop competition. The larger than life Double Loop Dare incorporated an enormous side-by-side loop, exerting a force of 7 G's which Team Hot Wheels™ drivers took on at a speed of 52 MPH. "I've been a fan of Hot Wheels since I was a little kid, racing cars around my parents' living room," said Tracy, a six-time Pikes Peak Champion and a Hollywood stuntman since 1991. "So to be able to be a part of something like this — with Hot Wheels bringing one of its toys to life — is remarkable." Meanwhile, Foust, who provided tremendous competition, and spirit can continue to boast about his latest world record obtaining the longest distance vehicle jump at last year's Indianapolis 500. Additionally Foust a world-renowned professional stunt driver has two Formula Drift Championships complimenting his three X Games gold medals. He raced for more X Games glory in the RallyCross competition on July 1 on ESPN. 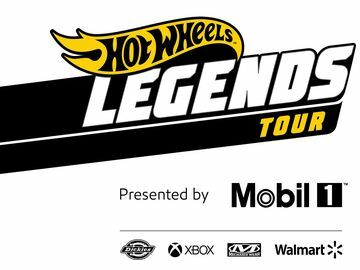 While the live broadcast took place on ABC and internationally on ESPN, footage of the Team Hot Wheels™ Double Loop Dare can also be viewed on the Hot Wheels® YouTube channel, www.youtube.com/hotwheels. Additional behind-the-scenes footage will be available on www.HotWheels.com. For added entertainment in 2012, Hot Wheels® will unveil 19, live-action webisodes on www.HotWheels.com. PLEASE VISIT WWW.HOTWHEELSMEDIA.COM FOR ADDITIONAL PRESS INFORMATION, HIGH-RESOLUTION IMAGES OR BROADCAST-QUALITY, DOWNLOADABLE B-ROLL. Since 1968, Hot Wheels has been passionate about creating thrilling vehicle experiences through innovative product and content. With a fan base of more than 41 million people, Hot Wheels is the No. 1 vehicle property in the United States producing the coolest cars imaginable. The Hot Wheels brand began as a line of 16 1:64-scale die-cast vehicles; today, it has evolved into a true, global lifestyle brand for boys of all ages with segments that range from aftermarket parts to licensed apparel to branded digital content from Team Hot Wheels, a real-life race crew of professional drivers performing over-the-top stunts. For the hottest games and videos, visit www.HotWheels.com and www.Facebook.com/HotWheels. Mattel, Inc. (NASDAQ: MAT) (www.mattel.com) is the worldwide leader in the design, manufacture and marketing of toys and family products. The Mattel family is comprised of such best-selling brands as Barbie®, the most popular fashion doll ever introduced, Hot Wheels®, Matchbox®, American Girl®, Radica® and Hot Wheels® RC, as well as Fisher-Price® brands, including Little People®, Power Wheels® and a wide array of entertainment-inspired toy lines. In 2011, Mattel was named as one of FORTUNE Magazine's "100 Best Companies to Work For" for the fourth year in a row, and also is ranked among Corporate Responsibility Magazine's "100 Best Corporate Citizens." With worldwide headquarters in El Segundo, Calif., Mattel employs approximately 30,000 people in 43 countries and territories and sells products in more than 150 nations. At Mattel, we are "Creating the Future of Play™."